The first of eleven defendants from two different companies indicted on 23 counts by a federal grand jury last summer has pleaded guilty to an attempt to cover-up the illegal removal and disposal of asbestos. Boston mesothelioma lawyers know that more and more often, state and federal authorities are pursuing criminal actions against those who violate environmental laws designed to protect against exposure to the deadly fibers. These cases show us that the risks posed by this once widely-used product have not dissipated, and officials must remain vigilant against those who are negligent with regard to the safety of workers, nearby residents and consumers. Asbestos, when left undisturbed, may not pose a major health risk. However, if the particles become airborne, they become deadly. This case, out of New York state, in particular is noteworthy for the fact that so many people were reportedly involved in the cover-up. One of the companies was an air quality control firm, which allegedly failed to properly conduct the required tests. Local news reports indicate that the first person to plead guilty in the case was the project compliance monitor for that company. He admitted to being an accessory after the fact. As part of his plea, he has admitted that he falsified inspection reports in order to protect the contracting company that was hired to remove asbestos from an older, six-tower housing complex. As the first to plead, he was allowed to plead to one misdemeanor charge, as opposed to any of the felony charges he could have faced, in exchange for his testimony against the other remaining defendants. These defendants also include government inspectors – two from the city and one from the state. The former compliance monitor has attested to the fact that both he and the contractor supervisor conspired to officially report that the asbestos had been successfully removed from four of the buildings, despite knowing this wasn’t true. To grant some perspective, this is a huge complex sitting on 17 acres of land. It had been a notorious blight on the area, which was visible from the expressway and positioned just behind a large medical center. Then, the housing authority made the decision to tear the structures down and redevelop the site into a $100 million retirement community. 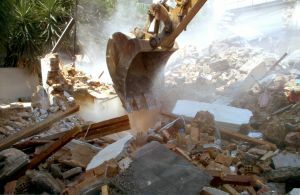 But in order to legally demolish property containing asbestos, the housing authority had to first hire a company to properly remove the asbestos – something they believed they had done. However, court documents allege that the companies told workers to cut holes in the floors and dump the material down these holes. Workers also didn’t properly wet down the asbestos before the work – a process that makes it less dangerous to handle because it decreases the risk of the fibers becoming airborne. The material was also reportedly left in open-air containers throughout the site. At this point, both companies are now out-of-business.